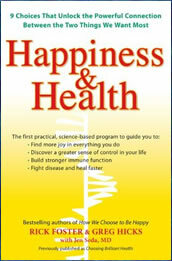 Happiness and Health is a practical guide that identifies and explains the physical benefits of positive emotions. It is written by Rick Foster and Greg Hicks, authors of ‘How We Choose To Be Happy’. In Happiness and Health, they offer insights into the science of positive emotions and outline how we can adopt a set of behaviors that improve our brain function, boost our immunity, and enhance vitality. The authors highlight the fact that most of us attempt to control our health by focusing on low fat diets, exercise regimes and visits to the doctor. They say that while these things are important we are not fully accessing the power of our thoughts, emotions and behaviors to influence our health. Scientific research shows that these psychological factors are directly correlated with good health and a strong immune system. Happiness and Heath states that it is important for us to recognize that these elements do not occur as a result of wellbeing but rather are the basis of what the authors refer to as a state of “brilliant health”. According to the authors, “Brilliant Health is a concept that we came up with to express what it means when you are experiencing a deep sense of vitality. Brilliant Health is also about intellect and using your cognitive skills to develop health and make the decisions and choices that change our biochemistry. Those people who are in a state of Brilliant Health use their higher brain to regulate biochemistry”. Happiness and Health does not include a diet plan but by following the principles outlined readers can become inspired and motivated to make healthier choices. Readers are introduced to what is referred to as the “model of health”, which involves following eight specific behaviors that can be integrated into daily life to improve health and prevent illness. Holding yourself accountable for your progress in relation to your personal health. Seeking out and following your passions in life. Devoting time to pursuit of your passions. View traumatic past experiences from a different perspective that includes meaning and recognition of new opportunities. Creating options in your life instead of giving up hope. Practicing gratitude for all of the positive things in your life. Give to others and accept the gifts that others wish to give to you. Always be truthful to yourself and to others. Happiness and Health does not include food recommendations. Happiness and Health does not include a sample meal plan. The book does not include any specific exercise recommendations however by following the principles outlined you may become motivated to start exercising so as to improve your health and happiness. Happiness & Health: 9 Choices That Unlock the Powerful Connection Between the Two Things We Want Most retails at $14.95. Will appeal to readers interested in both happiness and health. Encourages the reader to take responsibility for their emotions and behaviors. Concepts are based on scientific research. Contains inspirational stories related to happiness and health. Is not specifically a weight loss plan. Does not include diet or exercise guidelines. Happiness and Health attempts to unveil the mysteries of the mind-body connection by providing readers with a clear set of principles to follow that have been scientifically demonstrated to be associated with greater joy and vitality. While Happiness and Health does not include any specific diet or exercise guidelines, readers will be more likely to engage in health-promoting behaviors through gaining increased self-awareness, inspiration and motivation.